It was not my first time in Pampanga as I was there for so many times already. One of the most memorable is my visit to Porac where we went to a resort called Poracay, one of the most popular weekend destination in Central Luzon. You get there by first passing through seemingly dangerous terrains made out of ashfall - what once destroyed Pampanga after the volcanic eruption has become part of the tourist attraction. Poracay was composed of several swimming pools, a man-made lake where you can go kayaking and a zipline that will take you from one side of the lake to the next. The next memorable was the culinary tour in Pampanga which Museo Angeles sponsored. Our tour was not limited to Angeles as we also went to nearby parts of Pampanga aside form the talks held at the museum. One of the speakers was celebrity Chef Claude Tayag, known worldwide as one of the Philippines celebrated chef for he rose into fame when he was one of the personalities interviewed by Anthony Bourdain, world-renowned chef, bestselling author and multiple Emmy-winning television personality. Chef Claude Tayag was interviewed by Anthony Bourdain at his Bale Dutung restaurant which is sort of a high-end restaurant in Pampanga serving innovative Pampango cuisine with that special and unique touches of chef Claude Tayag. Bale Dutung means House of Wood, and is the home of Chef Claude Tayag and his wife Maryann. the house turned restaurant is inside Villa Gloria Subdivision of Angeles. This is our visit to another restaurant venture of Chef Claude Tayag called Downtown 1956 Cafe by Bale Dutung. They got so many offers to bring his brand in Manila but the chef has his reasons why he remains at his hometown. Pampanga is considered as the Culinary Capital of the Philippines since it's very rich in traditional cooking passed on from generations to generations. The capital of Pampanga is San Fernando but it is said that most of the happenings are in Angeles which is a highly-urbanized city mainly because it was once active with American troops with bases in Clark. It is considered as the haven for culinary, culture, arts and entertainment. It has been famous for its bars and nightlife scenes, and a dozen hotels can be found here with a few more currently under construction on the entertainment strip alone. 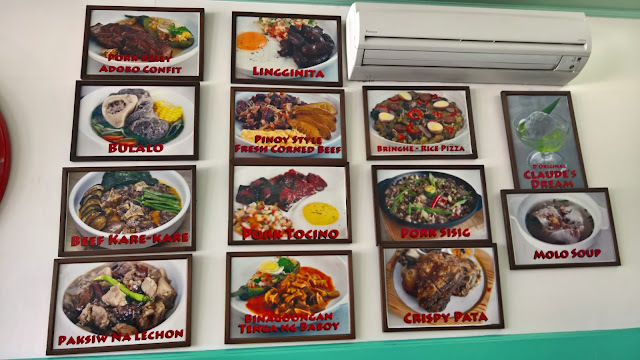 Pampanga is best known for it's sisig that has already evolved into so many variations just like our adobo which is cooked differently at different parts of the country. Did you know that the original sisig does not have an egg on top? 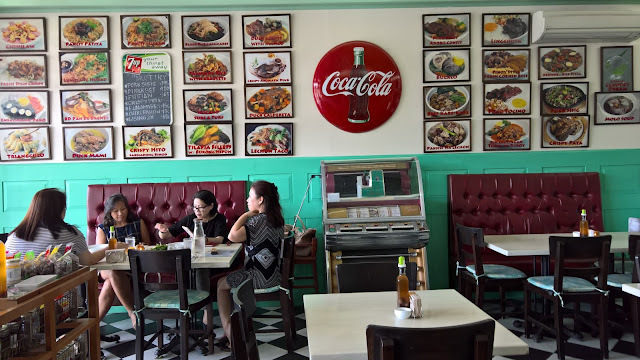 Adding to the first-rate cuisines and delicacies Pampanga is known for, is the Downtown 1956 Cafe by Bale Dutung, and yes, you've guessed it right, it's also from Chef Claude Tayag. We decided to visit his restaurant because of our scheduled trip to the 20th Philippine International Hot Air Balloon Fiesta in Clark, Pampanga. Since Froehlich Tours sponsored our transport service, we had a van to easily take us there from our Holiday Inn hotel in Clark. 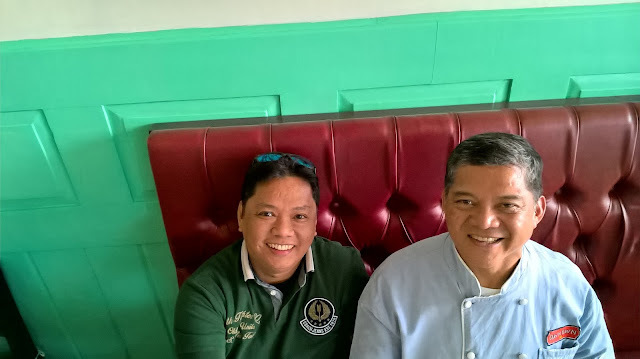 It was first in our Pampanga restaurant tour, and I have to say we are honored that Chef Claude Tayag personally came to meet with us so we can interview him on video. We were in Pampanga on February 10, a day before the hot air balloon fiesta which was scheduled from February 11 to 14. We were early because the hot air balloon fiesta opening ceremonies happens at dawn which is the appropriate time to inflate the balloons. It was best to be there early to witness the balloons start to rise into its full shape and then eventually fly up into the sky. The sight of all these hot air balloons all around you is simply breathtaking. I did a lot of selfies here on both photo and video to immortalize the memories. 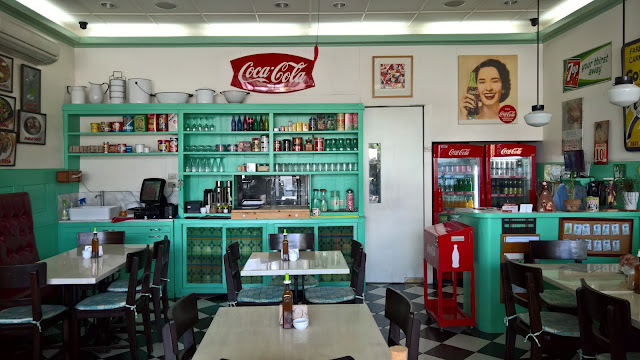 The Downtown 1956 Cafe restaurant is just a few minutes away from Clark where the event will be held. We were lucky that Chef Claude Tayag is available that day as he seems to be often out of the country especially for the Madrid Fusion events. His work has transcended way beyond the Philippines and is a familiar figure already all over the world. 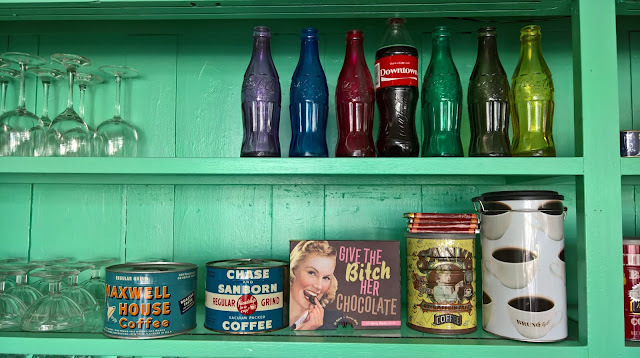 As the restaurant name implies, the theme is from the 50s so we see a lot of memorabilia to set the mood. It's like you time-traveled to the past during the years when we were not even born yet. 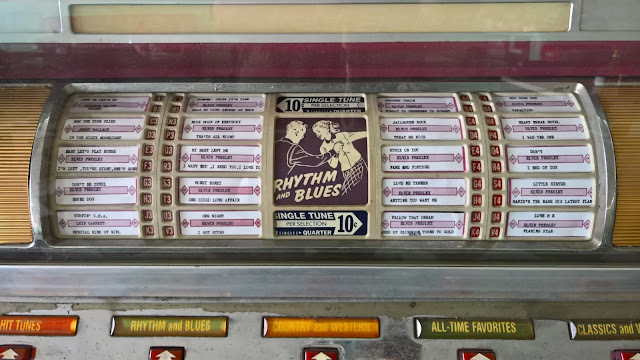 We even saw a jukebox that is currently scheduled for repair soon. 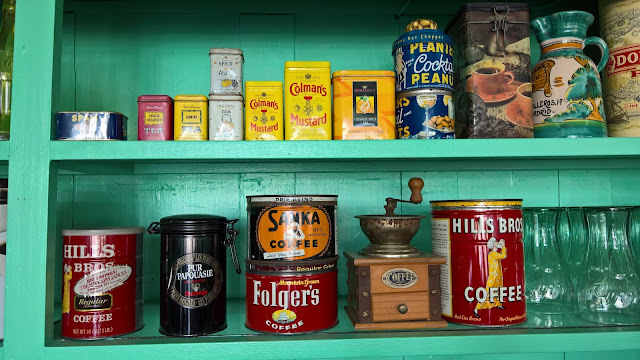 And though I do not patronize any Coke or softdrink products, you can never deny that the brand is already an iconic image that has made collectors very fond of having them as part of their treasured items. 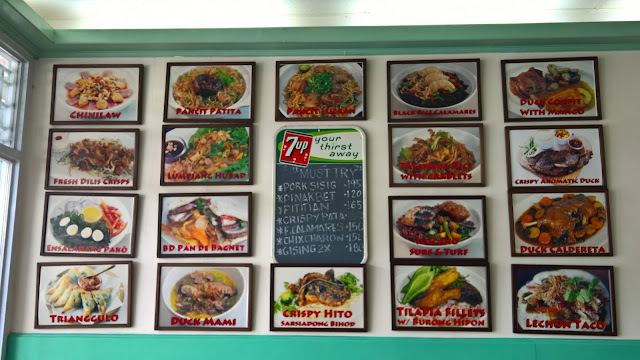 The photos of their dishes are all posted on their walls for the benefit of the customers to easily get an idea what the actual dishes look like. Though you must believe me when I say the dishes are far prettier, and yummier, in real life. 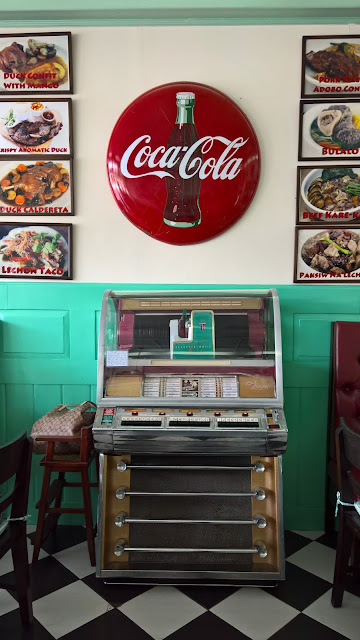 The trip to his restaurant, located at the Nepo Center just right beside the Nepo Mall was a bit of a search as it was Rommel's first time in the inner areas of Pampanga. Rommel was our designated driver from Froehlich Tours who picked us up from EDSA Shangri-La Mall, our meet-up place in Manila. I had no time to Google Map the restaurant as I was very busy with my other obligations back in Manila. 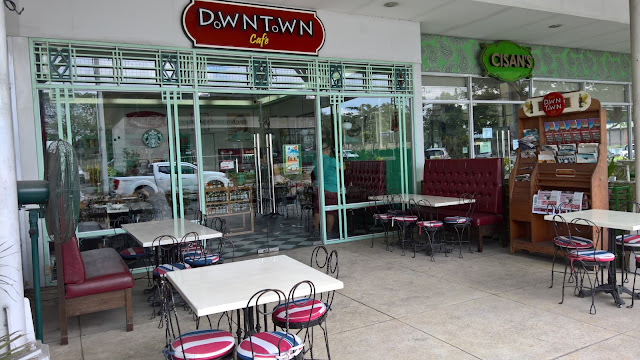 But after a few inquiries from the residents we passed along the way asking for directions, we finally reached the Downtown 1956 Cafe by Bale Dutung. Chef Claude texted me that he will be late as he was buying some ingredients back in Cubao. So he instructed his restaurant staff to let us dine first while waiting for him. He already advised them on what to serve us and allowed us to order anything else we like to try. The Trianggulo is something like a leveled-up lumpiang prito but served in triangular shapes. It's already tasty even without the special dip that comes with it. You can taste the freshness of the ingredients that truly lingers thus making it a great way to start our lunch. I've tried Lumpiang Hubad at many restaurant that serves it. Each one has their unique way of cooking it but I've learned to appreciate their uniqueness. This one at Downtown 1956 Cafe is strikingly more than just at par with the rest. This plate was immediately empty the moment we stopped taking photos. The Pure Talangka on Rice with Fried Crablets is now one of my favorite dishes here at Downtown 1956 Cafe by Bale Dutung. I love the crispiness of the crablets with its exquisitely appealing taste that would make you want to continue munching while having spoonfuls of the accompanying flavorful rice. Wow! The Pork Belly Adobo Confit is a winner! The dish comes with a half-slice of salted egg plus some veggies like an eggplant to make it really a superb choice. You will thank me so much for recommending this as it's so darn tasty and flavorful. The Bringhe or Rice Pizza is another flavorful Kapampangan recipe. They say it's the Filipino version of the world famous “Arroz Valenciana” usually served during special occasions. It's sticky rice or malagkit cooked with coconut milk, pork, chicken, hard-boiled egg slices, and some vegetables. Turmeric powder is used for color and flavoring. It is said to have originated from the northern province of Pampanga, is the Filipino's indigenization of the Spanish Paella. This is a mst-try dish when you visit Pampanga. Chef Claude brings the Bringhe to a whole new level with its rice pizza presentation. The 9-Spice dry rub Crispy Aromatic Duck is the king of our lunch time that day. It is served with Chinese Pancakes, Hoisin and Mango Salsa plus strips of cucumber. 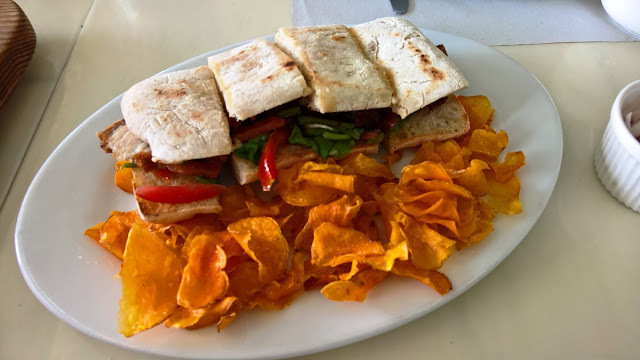 You really have to try this when you visit Downtown 1956 Cafe as it is a highly recommended dish that will make your dining experience a lot more memorable. What a great way to cook duck! The Pan De Bagnet is another favorite with an awesome taste. You'll get to enjoy the sensationally different way of cooking bagnet and having it as the main ingredient of a sandwich complimented by kamote chips at the sides. 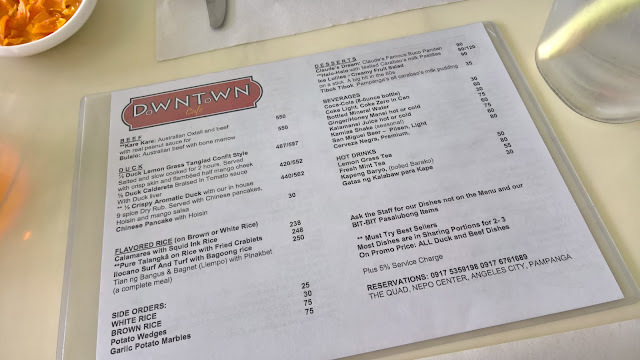 My colleague said the Halo-Halo at Downtown 1956 Cafe was the best he tasted so far. What's Chef Claude Tayag's secret? I think it's because of his special Carabao's Milk Pastillas that you pourbefore eating the Halo-Halo. Chef Claude Tayag will never call his Buko Pandan dessert Claude's Dream if it wasn't dreamy. 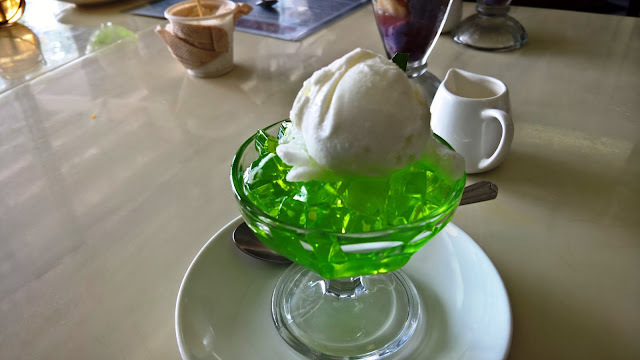 The highlight is the buko or coconut ice cream on top of the cubed Pandan-flavored jellies. Both kids and adults will love the creamy Fruit Salad Iced Lollies that comes handy with a stick. 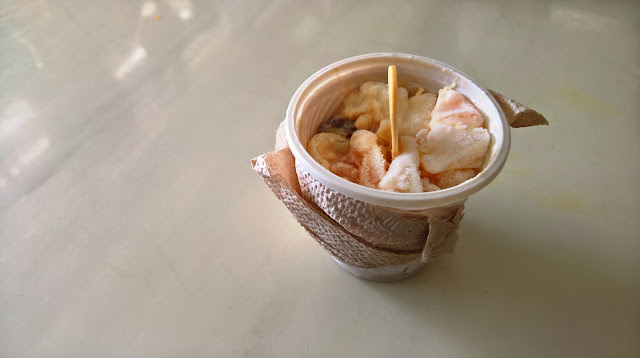 It's a childhood favorite that brings back memories when street vendors sell something like these outside the compounds of our neighborhood school. They should also create ones with the black Mongo beans or coconut "buko" strips to complete the experience. 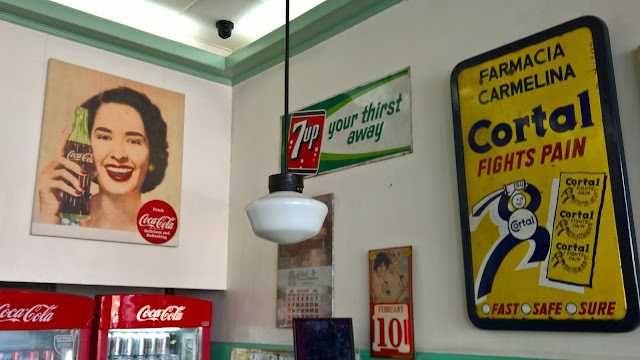 There are also plenty of choices for drinks here at Downtown 1956 Cafe. 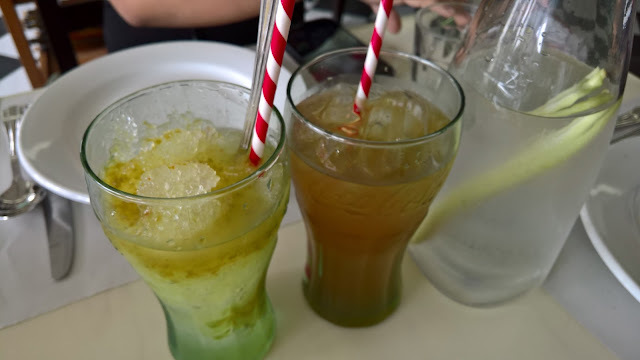 The must tries are the Kamias Shake and Ginger HoneyMansi Juice to refresh you from the hot summer weather. They also have hot drinks like the Lemon Grass Tea, Kapeng Baryo (Barako) and the Gatas ng Kalabaw para Kape. 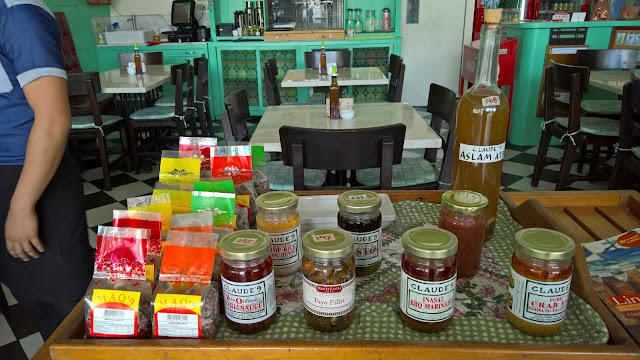 Be sure to visit Downtown 1956 Cafe by Bale Dutung whenever you're in Pampanga. You can check out their Facebook page for more details. Thank you also to our friends who joined us in the Pampanga Hot Air Balloon and Restaurant Tour. This is just our first stop in our restaurant tour as there are more to come like YuFuIn Japanese Restaurant, Koko Buri restaurant, and Mequeni of Holiday Inn Clark. Special thanks to Froehlich Tours for our official transport service, 1st Draft Manila Clothing for the shirts we wore on the second day or teh 1st day of the Philippine International Hot Air Balloon Fiesta, to Holiday Inn Clark for being our official temporary residence for our overnight stay, and Picturebook for the printed compiled images of our Pampanga adventure soon. 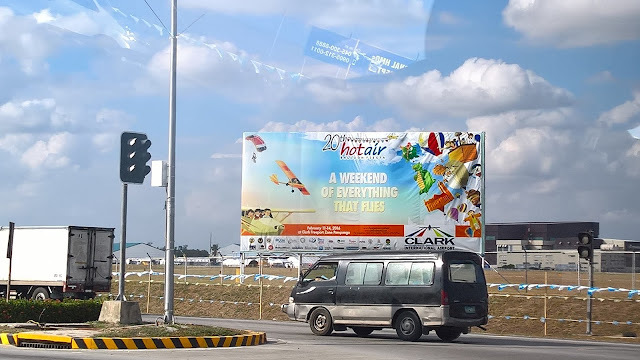 We wold also like to extend our thanks to the organizers of the Philippine International Hot Air Balloon Fiesta, especially to Captain Joy Roa and Dr. Ogie Cruz, for the special coverage of their event in Clark Airfield in Pampanga. See you all again next year! Check for updates at our official Facebook page at http://www.Facebook.com/wazzuppilipinas and our other social media accounts for more shout outs.